McLaren said it will build up to 1,000 MP4-12Cs in the car's first full year of production. McLaren Automotive has announced that the MP4-12C will have a starting price of about 200,000 euros (about $267,200) with tax when it goes on sale in Europe early next year. The automaker added that the supercar will be priced at 168,500 pounds (about $265,800) in the UK. The starting price in the United States will be between $230,000 and $250,000 when the car goes on sale there about a year from now. 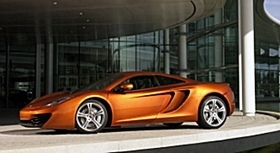 A final price for the U.S. market will be set in early 2011, McLaren spokesman Mark Harrison said. The MP4-12C's performance comes from a 3.8-liter twin-turbo V-8, rated at 600 hp, mated to a lightweight carbon-fiber chassis. The car has a curb weight of 2,866 pounds (about 1300kg). McLaren said it will build up to 1,000 MP4-12Cs in the car's first full year of production. After that, the company expects to build about 4,000 units a year. McLaren will assemble the car in Woking, England, at the same facility where it produces its Formula One racecars. The MP4-12C can be customized with a wide range of options. Buyers can choose from 17 paint colors and 14 interior trims. A sports exhaust system, carbon-ceramic brake discs, polished-finish calipers and two lightweight forged wheel options are some of the available performance upgrades. Also, the mirror casings, engine cover and engine-bay panels can be constructed from carbon fiber.